How can I get a STOPzilla Mobile Security License Key? If you lost the Key originally provided to you when you registered the product previously, give us a call at 1-877-877-9944 and a helpful STOPzilla team member will promptly retrieve your lost key. How do I install and register STOPzilla Mobile Security? 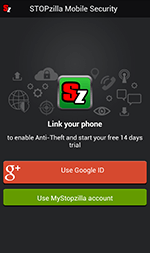 If you haven't already done so, please download STOPzilla Mobile Security app from the Google Play Store. 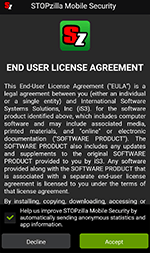 When the install begins, please accept the EULA. On the Get Started screen, you'll see the name of the phone. Verify the information is correct. This will be displayed in the my.STOPzilla.com account page. On the following screen, please select either your Google ID or a pre-made MyStopzilla account to Link the phone and enable anti-theft features. The Congratulations screen will appear. Select Start Trial Version to begin a trial, Get Full Version to purchase a license, or I already have a key to enter your license key. To register, select I already have a key. The license key screen will appear. Enter the key into the space provided, and then press Validate. How can I get help registering an online purchase of STOPzilla Mobile Security? 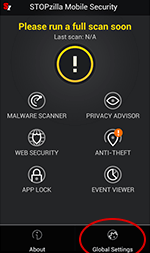 It is assumed that you have already downloaded the Trial Version of STOPzilla Mobile Security from the Google Play Store and purchased the app. If not, please download STOPzilla Mobile from the Google Play Store now. After you have installed the app, you can register your account using your Gmail credentials to setup and access your personal security portal. 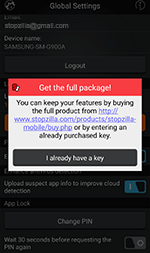 When you purchase STOPzilla Mobile Security, a message is displayed with your order number, indicating that you have purchased STOPzilla Mobile successfully. This means that your License Key will be emailed to you within minutes. 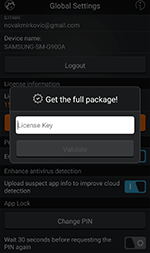 When you receive your License Key, open the STOPzilla Mobile Security app and click on your device's Menu button (this appears differently on most Android devices). Select Global Settings. Select Buy License. Select I already have a key. Enter your license key EXACTLY AS IT APPEARS in the "License Key" text box, then click the VALIDATE button. You're all set! I already have a License Key, where do I enter it? 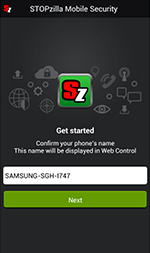 Open the STOPzilla Mobile Security app, and then press your Android device's menu button. Select Global settings. Select "I already have a key". Enter your license key exactly as it appears, then press Validate. Where can I get a link to download STOPzilla Mobile Security? 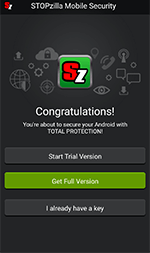 You can install STOPzilla Mobile Security on your Android device by downloading it directly from the Google Play Store. By default, the system downloads the trial version of the product. 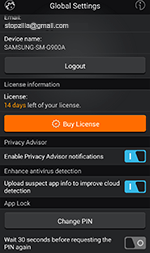 If you already have a License Key, you can register STOPzilla Mobile Security once the trial version is installed.